A garden is always moving forward in unexpected ways, but looking back helps us to understand the way forward. Do you look back at what worked and what failed for you? I review my year, maybe because I am going paperwork and creating end of year reports. I have not really done this with my garden though. I remember what worked, what did not, and I have ideas for the future. I am considering the drought and its effects on my garden this last summer, so I want to think about how I should proceed in a better way. I am viewing my failures, since we can learn so much more from them than a success. My biggest failure was the design for the spinnable compost bin. My design worked well with a small amount of kitchen waste, but when I loaded the bin with yard waste, the bin collapsed. I came up with a plan to repair the bin, but I went in a different direction. The problem is space. I had a good deal of wood, so I made this compost/recycling/work center behind my shed. The spinnable bin worked well for kitchen waste, but I wanted a larger compost production method, which for me meant the standing bin. The space where the spinnable bin was located could be used for planting. Giving more of my yard over to garden beds was a good decision for me. I have mentioned the trend away from lawns, and we each have to discover what is best for our lifestyles. I know that some people lament the loss of the American lawn, but I did not want to be a grass farmer. I am going to slightly extend the current layouts of garden bed to lawn, yet I feel that I have achieved a good balance. The children have play areas, and many of the plants did better than the grass. Another failure of sorts was planning out plantings. For the most part this did work out; however, I should consider plants that do well in droughts, or when I plant. I began focusing more on sowing seeds, which is more economical. Established plants going into the garden have done better, so next year I want to do better with starting seeds in flats, then moving them into the garden. I also had mixed results with my vertical garden. Again, the problem is starting plants from seeds. During the hot summer months, the seeds sprouted, but the plants had a hard time. Even though our autumn was warm with little rain and water restrictions still in place, the nasturtium started from seed enjoyed my vertical garden. I want to try more vertical gardens next year. Did I actually save money by growing my own vegetables? I think that I broke even. The drought caused me to water more, which was an expense, and as I said, I wasted money on plantings that failed due to a lack of watering. I did obtain most of my vegetables from my own garden. My method of gardening has allowed plants to return from seeds. Each winter I find cilantro popping up. Each spring brings spinach. My winter vegetables are producing food again. To be more successful, I have to plan out ways to save on water while producing vegetables. Reviewing my problem areas gives me ideas for the coming year. I really should sit down in January to create a plan. Part of this plan has to include preserving produce. I prefer to eat seasonally, but traditionally in Texas, the later months of summer are not good for vegetable production, and preserving vegetables was how families fed themselves. Some plants need that first bite of cold weather to produce the flavors we love. My ginger told me the time was right to harvest in Houston. I love gardens with some character. I have performed a few new construction home inspections recently, and I am always impressed at how quickly the bare yard is transformed into a garden. My only problem is that these scenes have been standardized, and I realize that I should not expect something else. In between inspecting two new homes, I concentrated on my meditation garden. This is the space that my wife and girls want based upon a little garden by a church. I moved the current landscape out of the way to begin making the path in a shape of a cross. The children and I began working on making decorations for a tree in the front yard that we want to look like a Christmas tree. With all of this going back and forth through the gardens, I noticed that the ginger was receding. 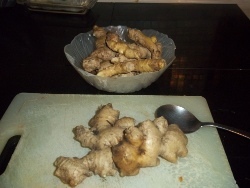 The few Houston cold snaps had convinced my ginger to go dormant, which means that harvesting was in order. You are currently browsing the From a Houston garden to the table blog archives for December, 2011.